I can't speak for all blogs, but here at Literate Lives, back when we were just launching our blog (and yes, back when we were writing more regularly! ), we had two authors who befriended us early on because of reviews we had written about books they had written. I love that life has come full circle: we now have reason to celebrate these two amazing authors again, 8 years after this blog started. So, "Happy Book Birthday Year" to two authors who found our reviews of their books 8 years ago, commented, and became our friends and regular readers of our blog over the years! Congratulations to two of our favorite authors - Barbara O'Connor and James Preller!!!!! I already reviewed Barbara's latest, and today it's time to share Jimmy's latest book with our readers. 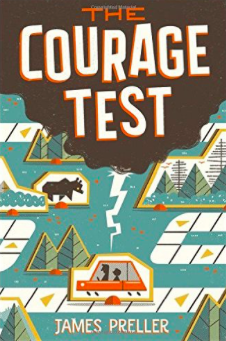 The Courage Test by James Preller is a great read that starts with the front cover. I have an ARC, so I'm not sure what the final cover art will look like, but what a great opportunity for a reader to look at the illustrations on the front cover, and begin thinking about what the story might be. So many clues live there - in some ways, it reminds me of the clues on the cover of another favorite, When You Reach Me. It's a cover you would come back to time and time again as the story unfolds. I say "the" story, but truly this is a book with multiple story lines contained within the adventure the main character, Will, goes on with his father. There is the story of Will and his father, somewhat strangers to each other after Will's dad left him and his mom for a "shiny new life" complete with a new girlfriend. In the story, Will's dad takes him on a trip to replicate the adventures of Lewis and Clark. Will's dad is a college professor, a fan of American history, and is trying to write a book about the Lewis and Clark expedition. Will would rather stay home and play baseball than go on a trip with a dad that he feels is no longer a real part of his life. The main story line follows them and their rocky relationship as they try to follow in the footsteps of Lewis and Clark. There is the summer assignment writing Will has - writing about something interesting that happened to him that summer. (To help the reader discern the different story lines, the summer assignment is the part written in italics.) I found myself mesmerized by all the historical detail Will puts into his writing assignment. So many, many facts about Lewis and Clark about which I had no idea! And having those facts written from Will's perspective was brilliant on James Preller's part - it makes reading history so interesting, and in some cases, quite surprising. I think student readers would enjoy the perils they faced as much as I did! This would be a perfect read for a student interested in history, adventure, and survival. There is the relationship between Will and his mom. They became quite a team once Will's dad left, and now she is practically pushing him out the door to take this summer trip with his dad. Will feels a bit hurt by that, but we learn even more history in the postcards Will continually sends his mom, with great details about places on the Lewis and Clark trail they've seen. In addition, we hear the voice of a boy who just wants contact with his mom. A friend of Will's dad, Ollie, shows up at one point on the trail, and stays with them awhile. Will and his dad find an "illegal girl" - in fact, that is the name of the chapter where they first encounter her. I tend gravitate toward reading books where relationships are explored, and that could not be truer with this book than its examination of the relationship between Will and his dad. James Preller had each new situation, each new adventure, each new moment of survival share just a bit more about that relationship. It was like slowly peeling back layers of an onion to get at what's really inside. I thought it was masterfully done, especially when, by the end of the book, Will and his dad grow to know and understand each other, but everything is still not perfect. That felt incredibly real to me, and I appreciated it as a reader. All these stories, slowly but surely, wrapped themselves around my heart and tugged at my heartstrings. I found myself caring a great deal about Lewis and Clark, Will's mom, Will's dad, and most definitely, Will. But, I also have to say, there were some breath-taking, scary moments as well - think bears and white water rafting. I have experiences with both, so I found my heart pounding at these intense moments. Finally, I'm a sucker for a circular story, so I loved that this story began and ended in the same place, with the same words. Be on the lookout for this gem - it is due out next Tuesday, Sept. 13, 2016. If you're a teacher, I guarantee there will be readers in your room that will be very thankful you added this book to their reading choices! Thanks so much, Jimmy, for sending this my way. 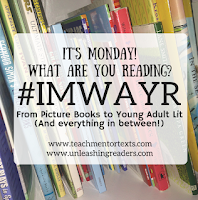 Happy almost-book birthday to you!! 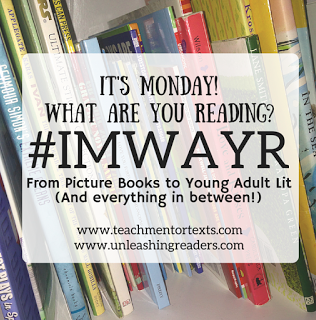 And a huge thanks also to Jen Vincent at Teach Mentor Texts and Kellee Moye at Unleashing Readers for hosting the kid lit version of "It's Monday, What Are You Reading?"!! You've made me want to run out fast for this new book, Karen, although I guess I'll have to wait about a week! I do love complex plots, and the story sounds as if it includes that with different storylines, and cleverly too with those postcards. Looking forward to it! Looks like a terrific book! I'll definitely put it on my To Read List! Thanks for this review. I've just requested it from NetGalley and if that doesn't work, I'll order it from the library! What a wonderful story! 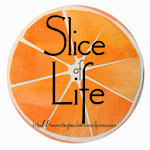 I love the friendships and connections that blogging can inspire, the writing and reading communities can be so welcoming, supportive and exciting! Karen, first, don't think that I go out and befriend every reviewer who comes down the pike. In truth, reviews make me uncomfortable. It took me a full day to come here, even after I knew it existed and assumed it would be generous. I find a lot of reviews, even positive ones (the only ones I get, cough-cough), tend to be superficial and flat: this happened, then that happened, followed by a sentence of opinion. Anyway, the reason why we became friends back in 2008 was because your review -- like this one, above -- was so perceptive and thoughtful. You were like . . . the Ideal Reader. Caring, intelligent, supportive, kind. I'm so glad you read my book. And don't worry, you are the only blogger who ever really mattered to me (don't tell Bill). Sounds like an awesome book, indeed. Even more awesome that the author found his way to read your lovely review.